For the past two days, Yahoo has been trying to get me to agree to an embargo on some piece of news they had for tonight. As you probably know, we hate embargoes, so I wasn’t about to accept it. Good thing. Not only did the news leak out almost 5 hours early, but actually, Yahoo itself was giving people hints on Twitter all day, and encouraging people to take guesses to break the embargo on Twitter . And yes, the news is a deal with Twitter. So first, the news: Yahoo and Twitter have reached an agreement to share data between their properties. That’s great. Yahoo is only a few months behind Google and Microsoft (Bing) doing the same thing. And really, I’m not entirely sure why some kind of special deal was needed. For search, Bing is about to take over the data aspect for Yahoo, and that will very likely include the Twitter data. Meanwhile, Yahoo’s frontend elements and services already include Twitter integration, including Flickr. Plus, isn’t Facebook Connect handling all the social stuff for Yahoo soon anyway? Well, I’ll wait for the press release coming in 4 hours for more details about that (see below). And, of course, 5, which hasn’t been released yet, will equal “Twitter” in some way. And those quick enough on the uptake could probably figure out that since Yahoo was using Twitter to hint this new deal, the partner is in fact, Twitter. Oh, Yahoo, thankfully you have MySpace to make you look not-so-bad by comparison (cycling team and all). As for Twitter, this is likely another solid revenue stream for the hot startup that now has the money-making engines going (with more coming soon). SUNNYVALE, Calif., Feb. 23, 2010 – As part of its ongoing commitment to be the center of people’s online lives, Yahoo Inc. (NASDAQ:YHOO) today announced a global partnership with Twitter to integrate Twitter’s real-time social experiences with more than 600 million people in Yahoo!’s global network. The integration is part of Yahoo!’s commitment to provide personally relevant information to people, from sources across the Web. People will be able to access their personal Twitter feeds across Yahoo!’s many products and properties, including the homepage, Yahoo! Mail, Yahoo! Sports, and others, letting them check in more easily on what’s happening with the people and things they care about while on Yahoo!. People will be able to update their Twitter status and share content from Yahoo! in their Twitter stream, so they can easily share their Yahoo! experiences with their friends and followers on Twitter. Yahoo! Search and Yahoo! media properties like News, Finance, Entertainment, and Sports will include real-time public Twitter updates across a variety of topics. Yahoo! 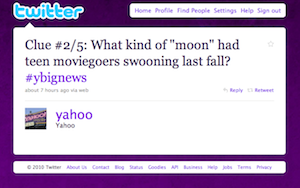 Search users will immediately see real-time Twitter results today; go to Yahoo! and try it out. Today’s Twitter partnership, along with Yahoo!’s recently announced Facebook relationship, will transform Yahoo! into a highly customizable social experience that lets people bring together and unify their activity from their many social experiences across the Web. Because of these connections, anyone with a Yahoo! ID can update multiple social networks simultaneously and stay in touch with the people and information that matter most at every moment of the day. The Twitter integration also provides full access to the complete Twitter public data stream, which Yahoo! will use to improve the relevance and freshness of content across Yahoo! properties. This will drive deeper user engagement, and create new and compelling opportunities for developers, advertisers, and publishers. The real-time Search integration is available immediately. Other parts of the integration are expected to launch later this year.